I was taking a portrait of sorts in our back yard (such as it is–not a lawn by any means) when I looked up and was shocked by this splash of translucent color not three feet away. 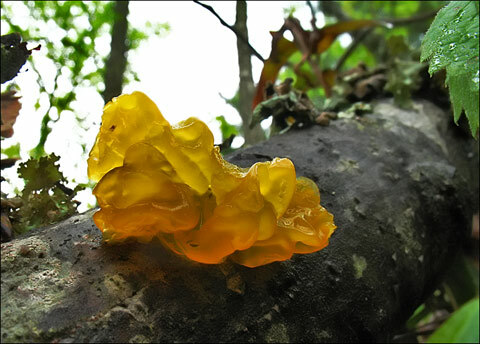 So when I was done with my primary objective (see those images tomorrow) I grabbed a shot of this a yellow “jelly fungus”. Some of you may be more familiar with the tannish “tree ears” or black-brown “witches butter” sometimes found on fallen limbs (due to the fact that this fungus absorbs a lot of heavy water and often brings down the already-dying limb that this saprophyte infiltrates with its microscopically-thready filaments called “mycelium”.) And herein lies a tale. And who better to tell it than Paul Stamets, myco-eccentric ecowarrier who has a vision for ways in which mushrooms are the path to our future. Highly recommend: Six Ways Mushrooms Can Save the World, a 17 minute video and well worth your time. Stamets describes fungal mycelia’s role in bringing back old-growth forest, as an effective antimicrobial agent against bird flu and many other deadly diseases, as a universal insecticide (for termites and carpenter ants), for soaking up and neutralizing organic pollution and as a basis so much more logical for biofuels than the use of food crops or even grasses. And many more articles by and about Stamets can be found at his web site, Fungi Perfecti. With numerous patents and publications and ongoing studies to his credit, he makes a big deal out of the kingdom Fungi because folks, this is kind of a big deal. It represents a new way of thinking about our future, and lord knows we could use some new ideas and soon. “Six Ways Mushrooms Can Save the World” is a bad link – it gives a 404 message. Reading through Fungi Perfecti was extremely interesting. I have Stamets’ book in my Amazon list – haven’t clicked on the “Order” button yet, though. So …….. question: is anyone in Floyd County doing anything with mushrooms? I spoke with Jagger Rutledge not long ago and he spoke of inoculating the chain saw oil with Shiitake mushroom spores – is anyone else doing anything with mushrooms in the area?